This format is very similar to the currency format although there are a few important differences. Once difference is the fact that the decimal points are aligned. Decimal places - The number of decimal places is from 0 to 30. Symbol - There are over 350 possible currency symbols to choose. The currency symbol is always displayed on the far left hand side of the cell and there is always an extra space that pads the right side of the cell. Negative numbers are always shown in parentheses which is an accounting standard. The number zero is never displayed and a dash is always displayed instead. All negative values are displayed in black (and not red). Any zero values are displayed as dashes. 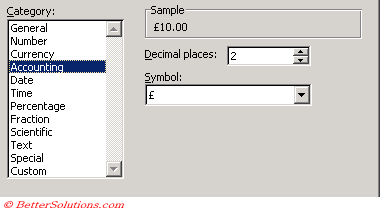 The actual position of the dash depends on the number of decimal places selected. These formats include spaces equivalent to the width of a parentheses on each side to ensure numbers are aligned in a column ?? 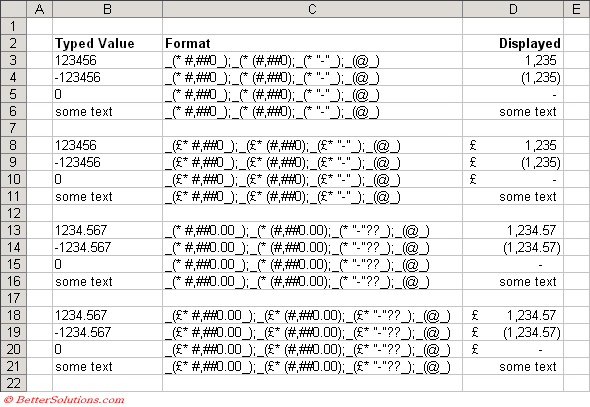 This format is the only built-in format that includes formatting criteria for text. This includes spaces equivalent to the width of a parentheses on each side of text so that it, too, lines up evenly with the numbers in a column. All these formats have their currency symbol flush to the left sign of the cell.